This is one sick novel. The premise is that Cleveland, poster-child city for mortgage foreclosures, loss of population to the south and all-around declining economy, is reborn through a series of humongous natural disasters. What happens everywhere else affects here – global warming, earthquakes and a tsunami lead millions of expatriates to return to their Midwestern roots. The protagonist is one Baron Garfield, a distant relative of the 20th president, real estate broker and land speculator. He grew up in Northeast Ohio and inherited his father’s real estate business. The time is in the near future. The local economy is in the dumps, what with a big chunk of Cleveland’s population ensconced in South Florida or Arizona, GM and Chrysler are kaput, almost no manufacturing jobs are left and there is a rising crime rate. (Sounds like now, actually). Median house prices are 1/3 of that in Naples or Ft. Lauderdale (if they’re not abandoned altogether), and the only thriving businesses are a couple of big medical centers. They’re doing well because the population is getting older and everyone is insured through the government. Problem is, when the old folks die off who will be there to replace them? What we need, says Garfield in a moment of fantasy to his mistress (yes, he cheats on his wife), is something to make all those Florida transplants come back. Mirabile dictu! A chunk of Antarctica the size of Connecticut breaks from the continent and proceeds to melt down. The oceans rise a few inches and some of the Maldives are abandoned to flooding. Beaches shrink in Florida and everyone is talking about what may happen to coastal property if the sea rises further. Lots of talk but not much else. 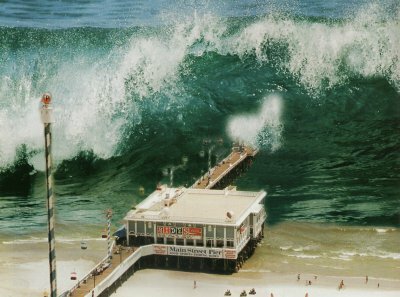 Then an earthquake opens a hundred mile rent off the Yucatan coast and generates a tsunami like the one that destroyed much of South Asia in December, 2004. Tens of thousands of Mexicans and Southwest Floridians drown, and vacationland is suddenly a hellish place. No one wants Florida property any more, at least not anything within 10 miles of a beach. Millions begin migrating to safer ground. That’s not just to Ohio of course, but Michigan, Illinois and other states from whence they came and still have roots. But Cleveland is especially popular because land and houses are cheap, roads are good and traffic minimal. A northeast Ohio buying/building frenzy ensues. Garfield’s business turns quickly. He delights in his new found fortune, and ‘thanks God’ for deliverance. Is he crazy or what? He has no family in Florida and has not (yet) suffered any personal loss. As the country tries to come to grips with this great national disaster, an earthquake severs half of Los Angeles into the Pacific and 2/3 of the city becomes uninhabitable. Millions move, or attempt to move, to Arizona, Nevada, Utah and elsewhere. It doesn’t take long for the ‘water problem’ to bubble up. There simply isn’t enough for all the new migrants from southern California. Phoenix and Las Vegas impose a building ban and riots break out. In short order Congress pushes through a long dormant plan to pipe water from the Great Lakes to Arizona and Nevada. Construction begins on huge pipelines from each of the lakes. The Lake Erie Pipeline headquarters is in Cleveland. More jobs, but more important, a lot more revenue. A tax on end-of-pipeline states goes directly to Midwest coffers: a vast transfer of wealth. Southwest residents don’t have to pay if they move to the source of all this water, and many do. Within a few years Cleveland is transformed into a boom town, as in the period before World War II, and is again the center of one of the country’s most dynamic regions. Much of the Midwest is also booming, but the focus here is on Cleveland and northeast Ohio. Garfield has become rich beyond his wildest dreams, remarried and run successfully for mayor of Cleveland. He is portrayed as soulless, clueless, greedy – but really is a metaphor for the entire Midwest population that revels in its good fortune at the expense of others. There is a pervasive 'our time has come' mentality, particularly among those who owned land or houses before all the natural disasters. The title is ironic, of course, because Cleveland gets very little sunshine relative to all the areas that are ravaged in this novel. But with others' misery Cleveland (and most of the Midwest) is bright and happy. What is redeeming about this silly novel? For starters, it’s well written. Jones previous novels centered on historical fiction ("Yellow", about the California Gold Rush, and "Grant's Tomb", about president Grant's association with Mark Twain), This effort is really in the same genre, except written in the future. Jones has honed his skill but is writing for the masses, not posterity. Another plus: each of the portrayed disasters (did I mention killer tornados in Oklahoma?) is individually plausible, and all can be expected to occur (in the next million years or so – just not all in a 5-year period). The author has done his homework, and explains the science behind each catastrophe so that we feel enlightened while utterly dismayed at the human cost. Adherents of 'global warming' as a looming end-of-planet scenario will particularly like Jones' description of the Antarctic meltdown and its consequences. There is of course a denouement, which I won’t reveal. You can fantasize what happens to Garfield. It’s not pretty, but you feel it coming and (probably) deserved. Sunshine in Cleveland is one of those books you can’t put down once started, even though you know you will pan it once finished. In other words, its a fun read. Just don’t read it on the beach.